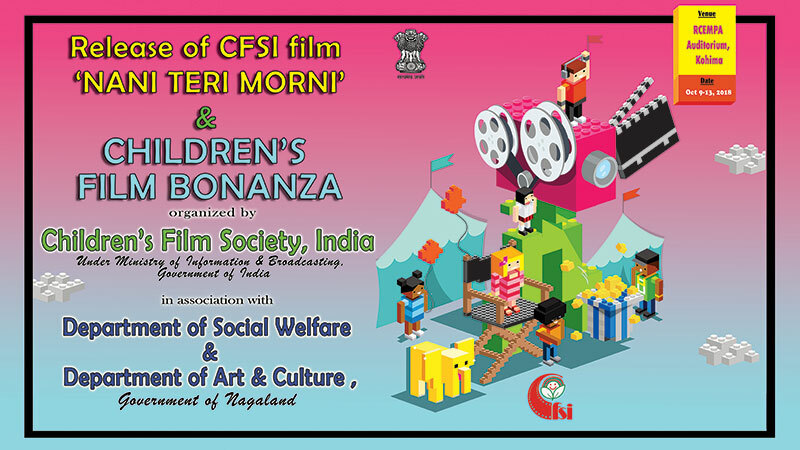 I am glad to inform that Children’s Film Society, India (CFSI) in association with Department of Social Welfare & Department of Art & Culture is organizing “CHILDREN FILM BONANZA (CFB)” from 9th – 13th September 2018 in Nagaland State alongwith Children’s Film Bonanza, CFSI is releasing in theatres its first Nagamese film “Nani Teri Morni”, Live Action short film, directed by Akashaditya Lama in Kohima at RCEMPA Auditorium. This 41 minutes film is based on Mhonbeni Ezung who was the youngest recipient of national bravery award for children in the year 2015 who had saved her grandmother from drowning thereby triumphing over her own fears. This film is based on a real life story. This release in North East region, will boost up the activities of CFSI and benefit the children of North East, and give then the taste of Indian cinema culture.